The OSS Mass Casualty Event Case is a hard cased mass casualty kit and Complete Training Center all in one. It houses twenty (20) individual throw kits for multiple victims and all critcal items needed when treating severe penetrating traumatic injuries including uncontrollable blood loss. The OSS Mass Casualty Event Case is an all in one Emergency Response Hard Case and Training Center . 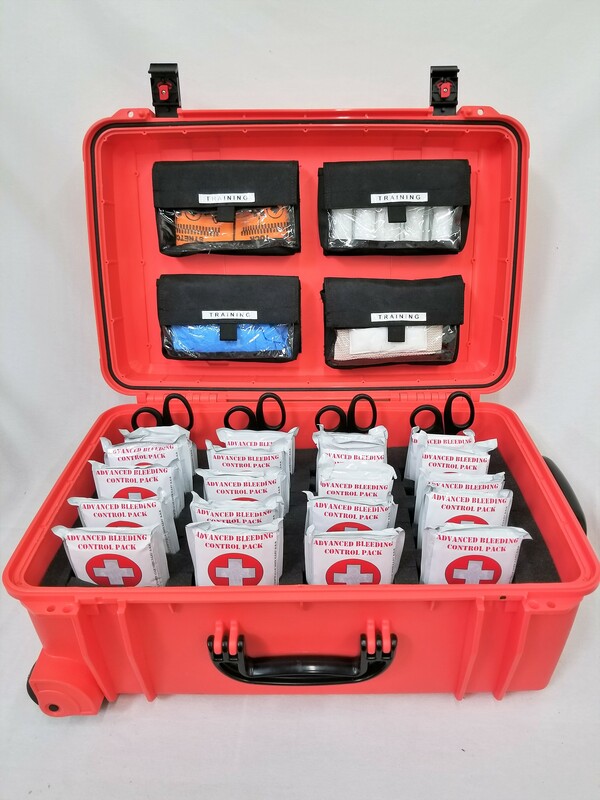 It houses twenty (20) individual throw kits for individual victims and all critcal items needed when treating several victims suffering from gunshot/serious trauma injuries. This Case is a readily identifiable and internationally used Rescue Orange color. The hard case itself is crush proof, water proof and corrosion proof with individual bearing wheels and an extendable handle for transportation. The twenty (20) throw kits contain a tourniquet, a Compression bandage, Sterile Packing Gauze, a set of nitrile gloves and a field instruction card. These individual kits can be dropped, kicked or thrown to individual victims in or around a mass casualty scene. These critical lifesaving itenms are currently used by medical staff to treat life threatening injuries such a those incurred by a single or multiple gunshots or penetrating trauma injuries with severe blood loss. This Active Shooter / Mass Casualty Case is currently in use by several Law Enforcement, EMS, Fire Rescue and scholastic agencies and departments worlds-wide. This case is also a complete training center contained on the inside of the cover. It has four (4) individual Training Modules that are removable and deployable into any environment. It has everything you need to teach any and all staff that may have to deploy these lifesaving items into a critical incident. It also comes with a Training Powerpoint to aid those learning about the use of these kits. A typical training class can take as little as under 30 minutes for most buisnesses training 25 or more individuals. The Hard Case is a 23 x 15 x 11 Self Contained Environment that is virtually indestructable and portable ie, crushproof, waterproof and pressurized with releif valves , locking mechanisms for securing the contents and easy individual bearing wheels for smooth transport . This is the same size as approved for carry-on baggage by all airlines.